Simplicity was a hallmark of the Flapper era, and yet simplicity did not imply lack of graceful style. 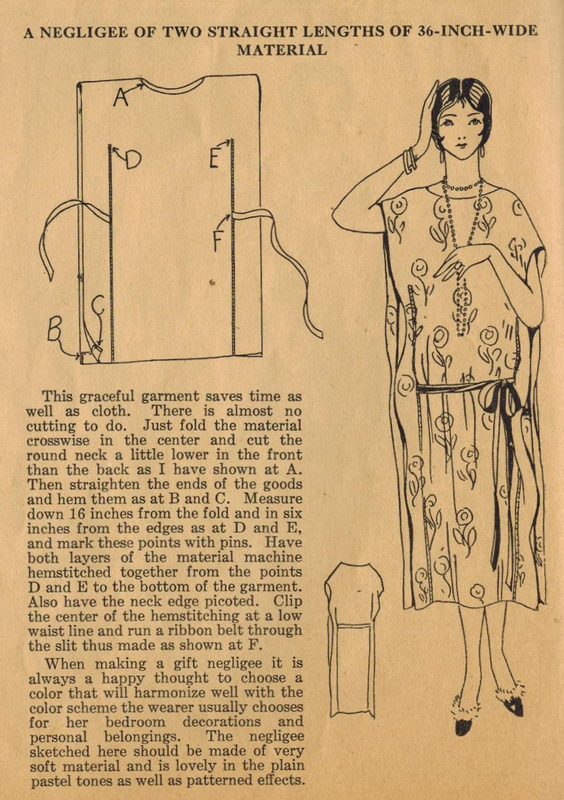 In this wonderful tip from Ruth Wyeth Spears, sewing expert and writer for the seamstresses of the 1920s, she describes how to sew a negligee that both saves fabric and time! Note that the construction calls for seams from under the arm to the hemline, with small openings at drop-waist for a ribbon tie belt. What could be simpler? Select a soft material, in a harmonizing color - oh, happy thought! :) Love those little slippers with fur trim. But why is she wearing a necklace, earrings, and bracelets? If you sew this negligee, let me know! Thanks for sharing this! I made this recently and it turned out great! So easy! Single duvet covers work a treat for this. Look really pretty and save a lot of side hemming. 1951 Re-Fashion - Reviving an Evening Gown! 1951 Shoes Put a Spring in Your Step! 1970s - At the Beach and After!